Yes, that's the one, and Paname is also the name of bistro on cusp of midtown and the Upper East Side, which opened just over three years ago, and is helmed at every turn -- owner, chef, pastry chef, wine director -- by Bernard Ros. 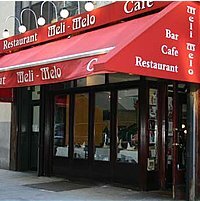 Chef Bernard is best known to New Yorkers as the owner of Meli Melo, a familiar sight on Madison Avenue for well over a decade with its flamboyant red awning (a color scheme Paname preserves). As I recall it, Meli Melo had some Mediterranean leanings. Paname, although it does offer pasta dishes -- like just about every French bistro in this town -- is more recognizably Parisian. I like the room very much: a neat rectangle framed in dark wood with brown banquettes, a walnut bar in the rear, and a few restrained Art Nouveau touches. It's intelligently lit as well, small overhead lights making sure the food is visible, while the room remains softly illuminated. I was invited on a recent evening to try some of the house classics. We started with a couple of flourishes from the kitchen, a sharp bite of anchovy and a mellow cube of tuna. Then it was into the world of the bistro. I can remember when octopus was a relatively rare candidate for a New York restaurant menu, and was regarded as somewhat exotic. It's been everywhere for the last five or six years, often chargrilled (sometimes to a cinder). Paname takes a different approach, serving whole baby octopi in a rich bath of fish stock: perfectly tender and surprisingly meaty. One of the prides of the maison, the boillabaisse (always on menu; unusually not a weekly special), served in a sort of sloping bath. The central feature of the dish, the rich, orange, saffron-tinged, warming broth, was very good. Beyond that, there were layers of interest: mussels, clams, shrimp, slices of cod, and -- perhaps best of all -- the croutons smeared with rouille which slid to the bottom of the bowl and were saturated with soup by the time we reached them. $28 is a fair price for almost a one-pot meal. The boeuf Bourguignon, on the other hand, is a special, but is almost always available. And the kitchen's approach is unusual. I've usually eaten this dish as hunks of slow-cooked beef, with vegetables, swimming in a thick, dark wine sauce. Ros, who cooks this a very long time indeed, allows the meat to absorb the wine almost completely. It's not dry, but it's a long way from a soup. As if to the underline the point, the meat is made to stand to attention in an edible pastry collar, before being topped with enoki mushrooms, and surrounded with seasonal vegetables. There are people -- one was sitting opposite me at this dinner -- who would choose pasta as their first, second, and third course if permitted. Myself, I don't look for pasta at a French bistro: but Paname has four on the menu, including a sirloin bolognese which the chef takes very seriously. It is not, he emphasized, a matter of throwing some tomato sauce in a pan with some meat and heating it up. He builds the sauce with care, and it takes time. I managed to find some room for it. What I really needed after topping off the bouillabaisse and boeuf with some pasta was a light, refreshing interlude. The violet sorbet was just that -- leaning towards an ice cream rather than a sorbet, though -- served in an elegant chilled vase. The first of the desserts proper was something I'd been curious about: something described as Adam's Apple. A baked, and I think marinated apple, served whole and topped with cream. I couldn't help much with the chocolate log, dramatic though the presentation was, although I managed to nibble from the interesting take on the classic tarte tatin -- this was a square of flaky pastry with slices of apples layered over it, but not caramelized. Plus ice cream, strawberries, and so on.